Most people we’ve met know what SketchUp is and what it can do, and those people generally think it’s the greatest thing since the three-button mouse. But what about LayOut? LayOut? What is that? How much is it and how do I get it? Well, if you own SketchUp Pro you already own LayOut. It comes bundled as a part of SketchUp Pro. 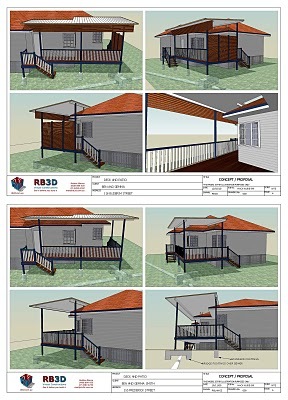 Robbie Blance of RB3D shows us how SketchUp Pro modelers are putting their models to work in LayOut – and winning more jobs. 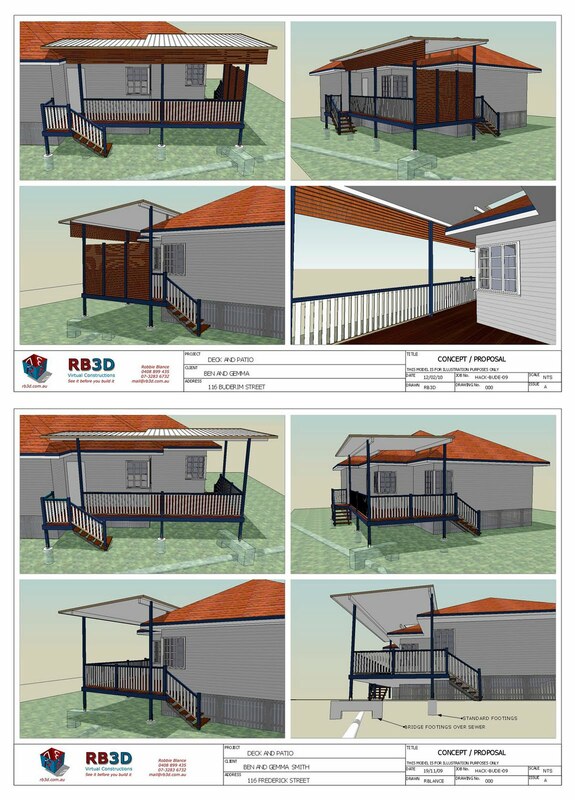 Nice presentation here..full marks, but the design and support of the roof structure over the deck needs another re-think. Good building practise would have the supporting structure positioned outside the line of the dwelling otherwise there is high risk for leaks through the roof penotrations. Maybe "Architectural Designers" in NZ have not invented a roof "Penotration" that does not leak, but we have. Perhaps you should look past NZ before adding any more condescending remarks. im sorry to point this out but that "foundation" (i use the term loosely) will never work. i applaud sketchup for its ability to make the inexperienced look professional. you must be very pleased. have you run this by a licensed architect? Ray! or is it "Big B"? or is it John? you signed off as a general contractor......you stick to that and leave the planning and designing to the professionals. And Jeremy...I agree with you, but, when a client wants a fly-over roof, the client gets a fly-over roof. Boundary restrictions and budget prevented anything more elaborate. You're taking quite a beating, Robbie. Bet you didn't expect that when presenting on the capabilities of LayOut. Excellent work. Very easy to follow concept drawings. This is exactly the type of presentations customers feel most comfortable with as they can sometimes get overwhelmed with in-depth technical drawings. As to all the negative criticism: any fool can criticise, it takes a pro to able to offer "constructive" criticism. Foundations look fine for the task. Keep up the good work Robbie. The presentation is the point here. Soon 3D sections etc. will be the standard. Jeremy and "Big B" perhaps ought to stay in 2D until they get some perspective. I must admit, the negatives had me for a wee while there. I forgot that there are still people out there using chalk and slate. Regardless of great use of 3d and sketchup, plot boundaries and owner requests, design is still .. not grat. We design professionals must admit that once in a while we are forced to live with bad practices, because we could not do anything about it. 3d is not a synonymous with good design. I, for one, am very impressed with the construction documents! I do not have Layout but, after seeing your work ... makes me wish I did. Maybe, someday, I'll rise to your level and be able to produce beautiful documents like yours. Kas, this is sketchup forum not a design forum. Sometimes punters just want to have practical solutions with a fixed budget. Not everyone needs to stun their friends with flashy design. They may just want shade and a flat deck.Blokes like Robbie with tools like Sketchup they can see it before they have it built. I just can't believe all the design criticism you're getting about this. Unfortunately, this is a field filled with opinionated remarks - and architecture in general seems to be the only field where where we rip each other down constantly rather than support each other (both in terms of design criticism and low balling fees - which could be why fee bases for architects are lower on average than engineering disciplines). It's like a disease that some designers get in school - that sticks when they don't get to see their designs built as much as others. They're happy when they're done seeing their sketches - and that's it. the pen and trace designers. If they did, they'd understand that each project is completely unique - the planning, the budget, the materials, the clients, the existing conditions, which mold the end result - they assume their ideas would work perfectly even though they have no idea about these things. And even if it did work... don't push your idea onto someone else's work. Most famous painters had all their work ripped apart at first - but you can't change the piece for heaven sake. leave it alone unless you've got something constructive to say. It's their design - if you don't like it, do your own and don't rip someone down. I challenge any of them to post one of their own designs and I'd be happy to rip it apart for no reason with no basis or reasoning. You'll always have pen and trace designers roaming sketchup blogs to criticize and to feel like their opinions actually mean something. keep building your successful business, RB3D. These guys will understand the "real" thing one day. The freakin thing works fine and the foundation looks easy from a construct ability point of view. I actually like the different approach of LAYERING the new to old - kind of pays respect in a way by seemingly depending on the existing. They wouldn't worry about the leaks if they actually understood there are 37 different ways to detail it NOT to leak. ever. move on people - build your own stuff. hopefully, RB3D will be there to rip you all apart for this sad display of support. Bravo for pushing the envelope in construction documents. love it. thank you. I like the way you used the transparency of the ground plane to show the foundation work underneath. Nice job. Nice set of CD's Robbie, I'm working on one myself. The one problem I run into with sketchup is the lighting in enclosed areas. For example I have a view in layout that show a section of a room but it is very dark and the color of the walls look different due to the lighting (the angle of the sun), evenwith shaing off. do you run into this problem? I think it's a good basic representation of the 2D graphics and options that you can do with the program. I feel bad for the people who posted negative comments about the visual object matter and not the subject, which really should be the LayOut program itself. Those negative "few" are completely missing the point of this presentation for the abilities of LayOut. And, I would agree with the statement earlier, It is easier to tear down, than to be positive. But the author, too, should have ignored the initial negative statements about the subject not being "to standard", and then kept to the discussion at hand. Being negative on a negative comment will only get one further into a very unproductive discussion. Am I being too critical by criticizing the critic... maybe. Thanks for the post Brandon. Great drawings! Cool to see what can be done with Layout. SketchUp is fast and as I get better/faster with Layout it will likely replace my other drawing software. Big thanks for sharing. I feel I have to explain something which is being missed....The colored drawings are "The Proposals" and the Line drawings are the final agreed design and development application for council. The bridge foundation in the concept proposals is the "council recommended" proceedure for building over a sewer line. The deck has a small cantilever on the corner nearest the sewer. Jayster...your right, but my first reaction as a mere male was to bite back. bwalsh305...Thanks for your insight I think we should all read your post again. I wish I had said some of that instead of biting. Bill.....Thats right it was a practical solution to fit the clients needs and budget. Charles....If you want I can send you the layout file I used. Brandon Thank you for posting this, I had no idea mine would get submitted, let alone generate this discussion. I think part of what people are reacting to is that your images are clearly the boring stuff that you send to get permitted and not the frilly stuff that usually gets published. If you were to fill up more of the image with plants, furniture, better selection of bitmaps and whatnot, it would go along way to make the image look more complete. I understand that it takes more time to do that though and that wasn't what you were billing your client for :p.
Thanks for the write up on layout, I will have to give it a second look. Great job, Robbie! I can look at your presentation and understand how the design works in seconds. That seems to have been the point. Keep up the good work. As I said presentation 100%..and I like your other work on your web too. As you say these types of roof penotrations can be acheived with various methods and be successful, what I stated was that it is NOT the best practise. If you are relying on sealants to flash the roof then you will surely have a leak in time and being that your penotrations are over loadbearing external walls this 'could' have structural consequences later. Your documents dont show or say how penotrations are flashed or sealed for watertighness, no doubt the local Authorities would ask for this detail when submitting for consent? I would like you to shear your methods here if possible. PS Do you have a photo of the completed project now? What we use is a moulded rubber boot which slips over over the roof penetration post. The moulded rubber boot is manufactured attached to a soft aluminium/Zinc sheet which acts as the flashing over the tile. Our use of sealants if very minimal. I will try and get some tech data for you. Thinking about it if you flashed up the post and around all sides with a flexible malable strip, then covered the posts with a sleeve from the underside of the roof all the way down to the roof this would be pretty watertight and require no sealants (except maybe directly under the roof). The sleeve could be aluminium or could have cladding fixed over 20mm cavity battens. This might sound over the top but it is what I would do as a safe guard & to ensure watertightness past 10yrs.